Bunchberry Meadows is a very special place. 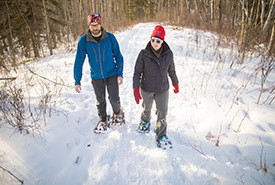 Located approximately 30 kilometres outside of downtown Edmonton, this 640-acre (260-hectare) conservation site is made up of old-growth forests, open meadows and wetlands. The forest supports jack pine, which is habitat for northern flying squirrels, porcupines and long-tailed weasels. The water and willows shelter a variety of species as small as tiger salamander and as large as moose. Owned in partnership with the Edmonton and Area Land Trust, Bunchberry Meadows is open to the public year-round for foot access. To estimate the number of users on Bunchberry Meadows, the Nature Conservancy of Canada (NCC) is using trail counters supplied from TRAFx. To learn more about these counters, please click here. • The property is open daily from 7 a.m. until 10 p.m.
• Access the site on foot only. Horseback riding, bicycles and OHV use are not permitted. • No dogs on site. • Do not smoke or light campfires. • Refrain from using camp stoves and BBQs. • Dispose of your garbage in the receptacles provided. • Respect wildlife and give them space. • Refrain from collecting plants, mushrooms and berries. • Do not use electronic surveillance devices. • Do not place geocaches on the property. Head west on Whitemud Drive. Turn south onto 215 St/Winterburn Road (6.5 km). Turn west onto Highway 627/Maskekosihk Trail (1.6 km). Turn south onto Range Road 261/Fleming Drive (5.6 km). The entrance to Bunchberry Meadows will be on your right. Click here to find Bunchberry Meadows on Google Maps. Learn more about the campaign to conserve Bunchberry Meadows. This project was completed with the help of the Government of Canada under the Natural Areas Conservation Program and the Alberta Land Trust Grant program and opened to the public with the support of Federated Co-op's Community Spaces.